We would love to work with you to sponsor a small gathering with your friends and family. Please let us know your interest as soon as possible! I have a close family, and I knew it wouldn't be a challenge to get plenty of us together over the holiday season. 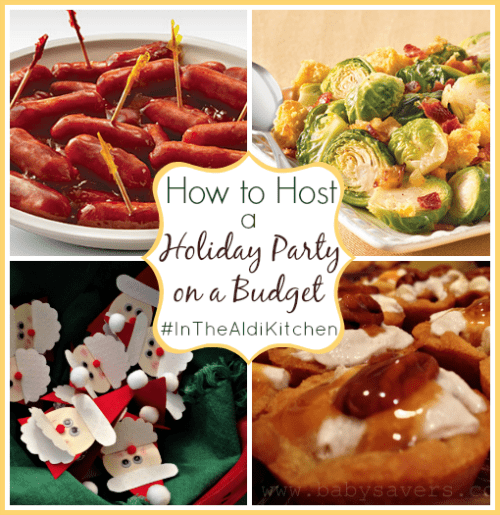 Plus, I recently had a front row seat to see and try several items from the ALDI Happier Holidays Recipe Book, and I knew there were some delicious items that I wanted to make and share with others! Most of my family lives in a city about 150 miles away from me, My sister offered up her house for the holiday party location, and it just made sense since most of our family lives in the her city. I'm obviously comfortable in her kitchen and the rest of her home, so I didn't have a problem hauling all my groceries in and taking over her kitchen to get all the food ready! 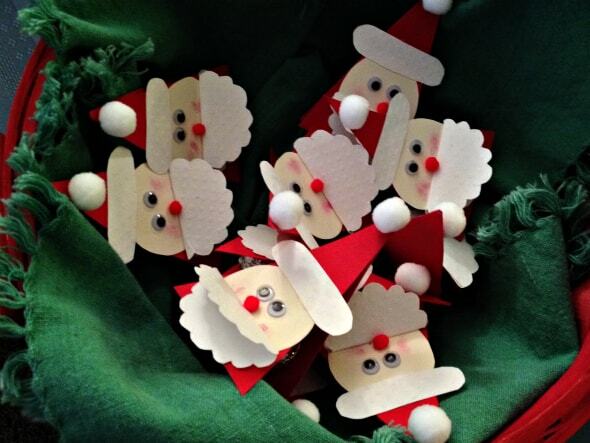 My aunt and my niece made these adorable Santa party favors. They're made from cream, white and red cardstock cut into shapes. A wrapped peppermint patty is under the big red triangle flap! My sister enlisted our mom and our aunt to wrap a bunch of prizes so we could do the White Elephant Dice Game. Everyone sat in a circle, and we had three bowls with two dice in each bowl. Everyone got to roll the dice. If he or she got a pair, she could take a wrapped gift from a pile in the middle of the room. Then the bowl was passed along to the next person. We had over twenty people attend our little party, so three sets of dice moving at the same time really helped speed things along! 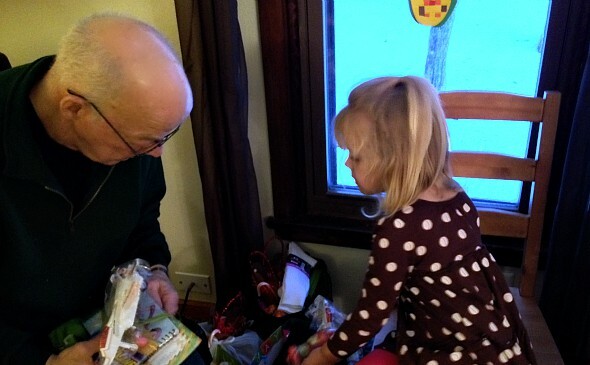 This is my dad and my daughter sorting through their prizes. I think they pooled their presents then divided them up between them. You can see that they had a pair of socks and a few notebooks, among other things! Then we served the food. I love cooking and sharing good food, so the only rhyme or reason to what I decided to serve was that I liked how the recipe looked! ALDI had given me $100 in gift certificates to buy food and wine for a 10-person party. We had over 20 people at our gathering, but my family generally doesn't drink alcohol, so reallocating beverage money to more groceries definitely helped my lean budget! 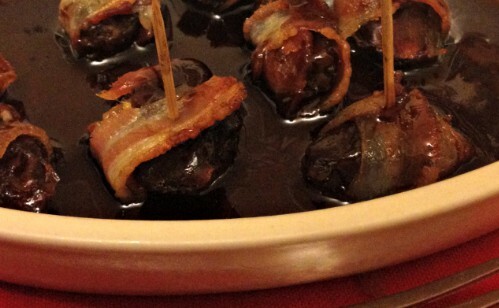 Party Poppers: Bacon-wrapped dates alone is a stretch for my non-foodie family, so I didn't want to push it by stuffing the dates with goat cheese and pecans. Instead, I wrapped the dates in bacon and baked them in a balsamic maple glaze. They were fabulous! Twice-Baked Sweet Potatoes: I baked really small sweet potatoes, scooped out the centers and mashed them with butter and brown sugar. Then I filled the skins back up with the mashed filling, topped with dried cranberries and a sprinkle of cinnamon and sugar before baking them again. 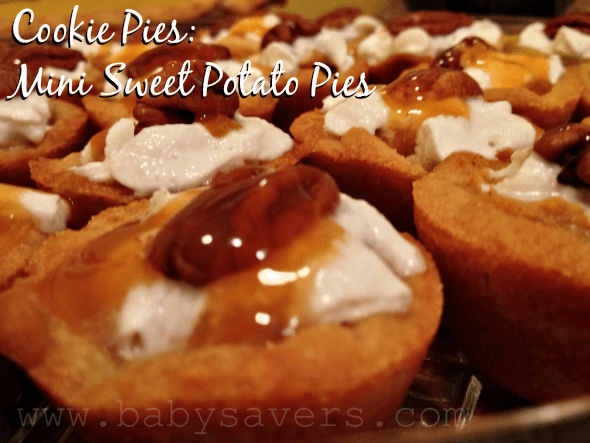 They were fantastic and a fun hybrid of baked and mashed sweet potatoes! 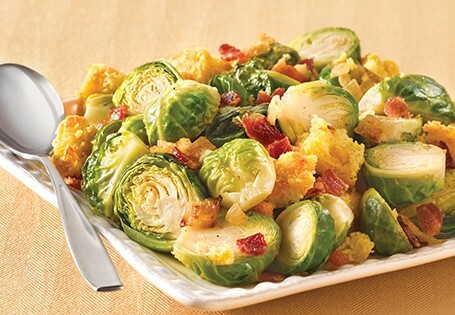 Beyond Compare Brussel Sprouts: I didn't change a single thing about this recipe–it's delicious! Broccoli Salad: This is another recipe I didn't change. I definitely recommend it! Holiday Cocktail Sausages: This recipe was incredibly easy (it's essentially cocktail wieners and barbeque sauce with a few extra items thrown in), but it wasn't as loved as the rest of the menu items. My husband assured me that they tasted fine, but I guess everyone was more into the other dishes. For dessert, I made a ton of Cookie Pies, which are my new favorite treat! I knew some people attending the party would balk at the idea of mini sweet potato pies, so I made a point to keep the ingredients totally secret until everyone had tried at least one bite (or popped an entire mini cookie pie into his or her mouth!). Sweet potato pie isn't a common or popular recipe in the upper midwest where I am, so I definitely surprised and delighted almost everyone at the party when I revealed that the pies were made from sweet potatoes! All in all, the party was a big hit and it was so much fun to gather family together for good food and fun times. I also loved being the bearer of good news by sharing a lot of ALDI goodness with my parents, my aunt and uncle, my brother and a few others who have never shopped at an ALDI store before. While there isn't one in the city where we had the party, I know at least a few of the attendees will go out of their way to check out the stores when traveling in the future. 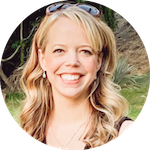 Let me know if you end up trying out one or more of those recipes! Disclosure: ALDI provided me with gift certificates and recipes to facilitate this post. 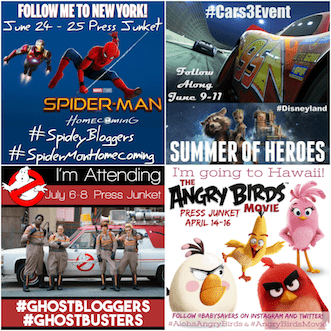 I waas also given gift certificates to share with guests. I was not paid for this article, and all opinions are my own. I love Brussels sprouts! This recipe looks great, I can’t wait to try it. Jenn the brussel sprouts are amazing! I’ve made them twice in the past few weeks. I do drink some wine and like Aldi’s collection, especially WInking Owl and the Petit Chocolat. Yum! Grocery stores can’t sell wine in Minnesota, so I’ve missed out on their wine and beer selection. I’ve heard great things, though! Can I come next time? The food looks great! I’ve always loved those little cocktail sausages. I will have to check out the Aldi test kitchen. Thanks for the post!